We provide a full range of complementary therapies and treatments to ease ailments and injuries and put the joy back into everyday living. General - Get rid of your pain and stiffness and improve sporting performance. Cranial - a safe, gentle and non-manipulative technique. Often used when treating infants or children, but also in adults who prefer a gentler treatment. Baby And Child - a gentle non manipulative technique that could help soothe and relax your baby. PILATES AND SPORTS MASSAGE - Increase your flexibility and strength, rehabilitate from injury and improve your sports performance. Massage and Reflexology - Ease aches and pains, soothe away stress, promote healing and improve wellbeing and vitality. Bespoke Nutrition guidance, weight management and food intolerance testing – Natural, Balanced, Healthy. Eat your way to good health with our expert guidance. 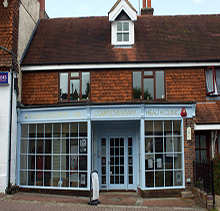 Located in Hurstpierpoint, we are a premier osteopathy and complementary treatments clinic for the Sussex and Brighton areas. There's plenty of parking nearby and a lovely garden for children to play in, or for you to relax in before or after your treatment. Easy Access from Brighton and all parts of Sussex.